Trying a new fitness class is easier with a friend who can help motivate you along when things get tough. When it comes to fitness, pairing up with a buddy is often the best path to success. A fitness buddy can offer moral support, share healthy recipes and offer exercise advice. Living in an active adult community makes it easy to find friends with shared fitness goals, while a variety of healthy activities support your fitness journey. Living among peers is one of the key benefits of living in an age-restricted community. With neighbors who are fellow empty nesters or retirees, it’s often easier to find friends who have similar lifestyles and health needs. When you’re new to the community, you can meet people by visiting the clubhouse, working out in the fitness center or taking part in community events and activities. Most communities have many activities and clubs designed to support healthy living. Special-interest social clubs may revolve around specific goals like strength training or weight loss, or around particular activities like tennis, bocce ball, walking or tai chi. By joining a social club you can find group support, make a few closer friendships and hopefully find a great fitness buddy. If the community has a full-time Activity Director, they can help you choose the best group for your needs. Beyond social clubs, active adult communities often provide the facilities to support your health goals. State-of-the-art fitness centers may offer cardiovascular and strength-training equipment, aerobics and yoga studios, indoor walking tracks and indoor lap pools. Community grounds often feature outdoor swimming pools, walking trails and sports courts for activities like tennis, basketball, pickleball and bocce ball. 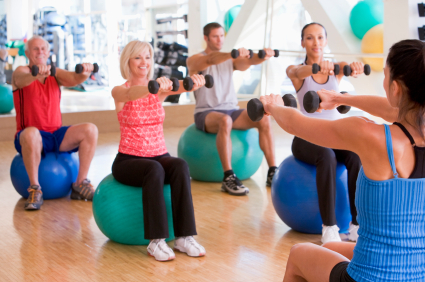 Group fitness classes also add variety to your exercise schedule. Some popular offerings include classes for aerobics, yoga, tai chi, Zumba and water aerobics. Clubhouses may feature demonstration kitchens with classes based on healthy cooking and nutrition as well. While all of these amenities and activities help build a healthy lifestyle, you are much more likely to use them if you have the support of a fitness buddy. Going to a new fitness class or trying a new activity is much easier when you have a friend by your side. A fitness buddy can cheer you on when you are low on motivation and help you celebrate your successes. The opportunity to do the same for your friend can also be very rewarding. Joining efforts with a fitness buddy may even change your lifestyle beyond your regular workouts and healthier diet. As you begin to feel better about your health, and more confident in trying new fitness activities, you may find yourself becoming more open to other opportunities. You might decide to attend a lecture series, learn a foreign language, travel to an exotic place, try a new hobby or become more involved in the community. Creating a healthy lifestyle takes some effort, but finding a supportive fitness buddy will make it much easier to reach all of your fitness goals.